June 25 was a big day for 29-year-old Brian J. Terwilliger. 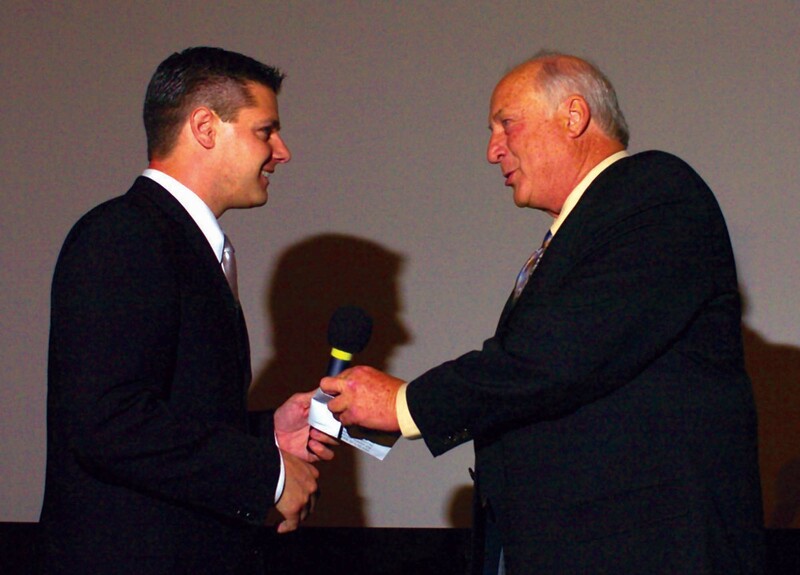 On that day, over 800 people arrived at the Hollywood Pacific Theatre, to see the premiere of “One Six Right,” which Terwilliger produced and directed. From what I experienced that night, it’s doubtful if anyone left without being moved by what he or she saw. It’s intended that this one-theatre premiere will lead to theatrical distribution so the many millions of aviation fans around the country, and the world, can see some of the spectacular flying scenes, and experience the “romance of flying” through the comments of the many pilots interviewed. 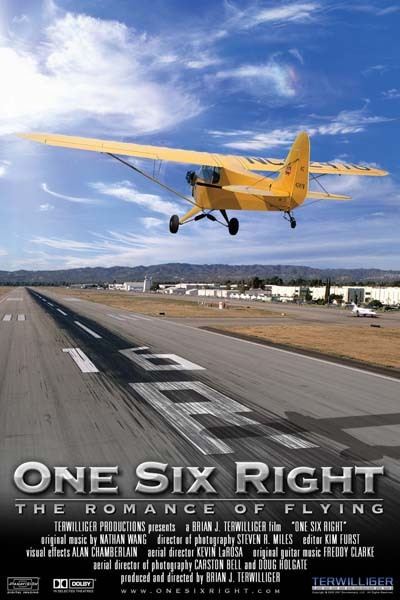 Although not everyone is an aviation enthusiast, “One Six Right” would be well received by general audiences for its aviation historical perspective as well as its disclosure of the value of general aviation and small airports. For slightly over an hour, pilots and non-pilots alike watched this documentary about flying and Van Nuys Airport, home to myriad diverse aviators and aircraft for over seven decades. The rousing standing ovation Terwilliger received after the film was just the first sign that his labor of love had been well worth it. Terwilliger’s personal experience is a big reason he set out on an over five-year mission to make this documentary. While growing up in Connecticut, he wanted to be a professional pilot, but he gave up on that dream when he discovered he was colorblind. 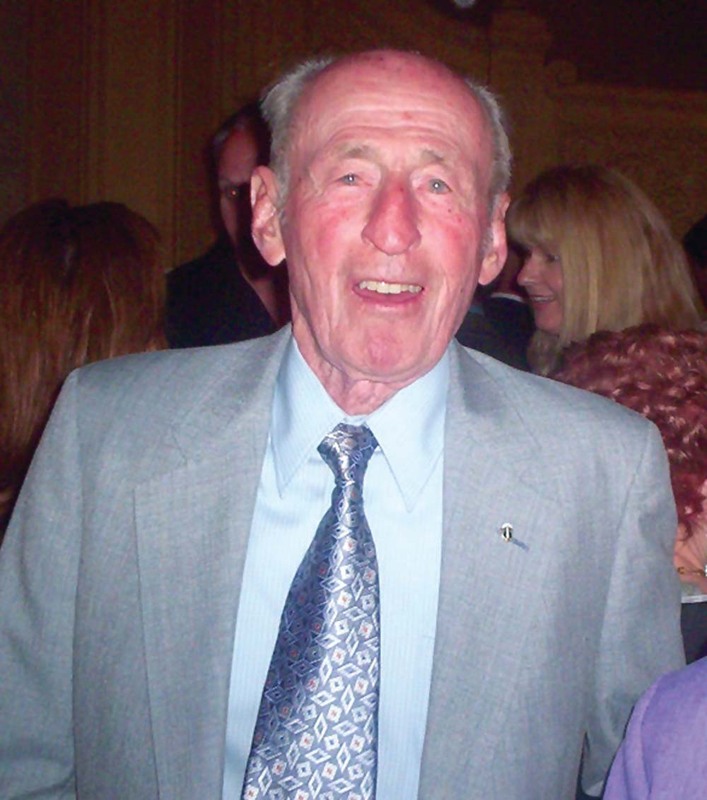 At the age of 16, Terwilliger moved to Southern California. In high school, he picked up another interest when he took a high-school course in cinematography. After graduating he became involved in the film industry. He worked on a variety of films from “Big Fish” to “The Core” to some commercials and other small projects, as well as website development and design. In 1995, when he was 19, the yearning to fly was still there, and he took his first flight lesson at Van Nuys Airport. He soloed three months later and got his license six months after that, and says that flying is a big part of his life. As pilots tend to want to do, he feels the need to share his passion for flight. “This film hopefully captures what I love about flying, and why I’ve always been so fascinated with it,” he said. Brian J. Terwilliger took five years of effort, persistence, organization, coordination, and photographic skill to produce and direct “One Six Right”—and he’s only 29! “I wanted to archive the airport where I learned to fly, which I think is one of the most fascinating airports in the world,” he said. But the project continued to grow. Along the way, Terwilliger received a lot of help. “Literally hundreds of people came together to help me make this film,” he said. Van Nuys Airport, which celebrated its 75th anniversary on Dec. 17, 2003, has fascinated Terwilliger since he started flying there in 1996. In 1928, a small group of men came together to incorporate Metropolitan Airport in the rural San Fernando Valley, on 80 acres of farmland. Just a year later, pilots flying out of the airport included celebrities such as Howard Hughes, Cecil B. DeMille, Gene Autry and Wallace Beery. As the airport grew, it attracted fliers like Bobbi Trout, who flew out of the airport to break the world’s endurance record for women, and Amelia Earhart, who broke a world speed record over its runways. Then, in 1942, the U.S. Army acquired 163 acres of airport property to construct the Van Nuys Army Air Field. Two years later, as a joint effort between the U.S. Navy and the Lockheed Aircraft Corporation, the Navy-Lockheed plant was constructed. In the meantime, Hollywood continued to film movie scenes at the airport, including scenes from “Casablanca.” After World War II, in 1949, the City of Los Angeles purchased the airport from the War Assets Administration for one dollar, with the provision that the California Air National Guard base remain on site. The airport became San Fernando Valley Airport, but was renamed Van Nuys Airport in 1957. Ranked 25th in operations nationwide in 1959, VNY steadily grew busier, until, in 1971, with a total of 562,079 operations, it was ranked the busiest general aviation airport in the nation. Today, VNY remains the world’s busiest GA airport, averaging nearly one-half million takeoffs and landings annually. Barry Schiff, main film narrator, introduced Brian J. Terwilliger, “One Six Right” producer/director, to the Hollywood Pacific Theatre audience. More than 100 businesses are located on the 730-acre airport. While contributing $1.2 billion each year to the Southern California economy, it provides a base for fire, police, air ambulance, search and rescue and news media aircraft that serve the local community. All those facts aren’t enough to get people excited about Van Nuys Airport, or aviation in general. But Terwilliger thought he knew what would. He began talking to those who flew out of the airport and shared his passion for flight and history. His fascination with the airport grew, as did his belief that the airport “had a story worth telling” and that the story would be fascinating to those pilots outside of Southern California and even those people who’ve never been in a cockpit. “It’s not just for pilots, and it’s certainly not just for the Van Nuys area,” he said of the finished product. He’s been pleasantly surprised to receive a lot of input from other countries, particularly the United Kingdom and Australia. Although Van Nuys Airport could be considered the center of the documentary, he says its true center is the love of aviation. Initially, Terwilliger began pursuing the idea of a documentary as a way of archiving the airport’s 75 years of history, and began trying to get support for the project. “I was trying to get people to back it, not only financially, but with their name, and with some services and donations of any sort,” he recalled. In 2000, seeking vintage photos, film and historical information, Terwilliger got in touch with Los Angeles World Airports, which owns VNY (as well as Los Angeles International, Ontario International and Palmdale Regional). Although they wanted to hear more about the project, Terwilliger “didn’t get very far with them at first.” However, when he started gaining momentum, they pitched in to help. 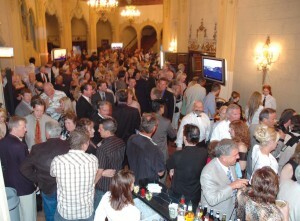 Part of the crowd in the lobby of the Hollywood Pacific Theatre for the after-party. “They saw the direction I was going, and didn’t see me as a threat, as I think they did in the beginning,” he said. It was the first check ever written for this project, and I’m forever grateful to him,” Terwilliger recalled. 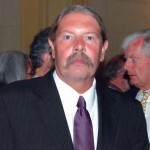 “Airport Journals heard about Terwilliger’s project, and featured him in February 2003. Shortly after that, Jim Dunn, the owner of Airtel Plaza Hotel, located at VNY, asked to meet with him. Terwilliger was thrilled when Panavision, based in Woodland Hills, Calif., donated state-of-the-art, high-definition equipment (16:9 aspect ratio), on which he only had to pay insurance. The charitable spirit continued. 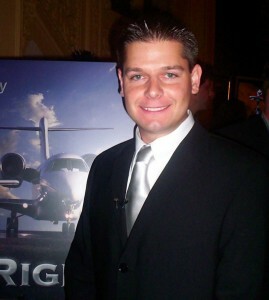 After learning about the project, Kevin LaRosa, a well-known helicopter pilot in the movie industry, as well as a P-51 owner on the airport and owner of Jetcopters, Inc., donated his helicopter and services as a pilot, as well as a Gyron camera (high-definition and gyroscopic on all three axes) to direct and film aerial sequences. “For the documentary, Terwilliger interviewed 85 pilots that flew out of VNY, including well-known names such as Sydney Pollack, Lorenzo Lamas, Clay Lacy, Barry Schiff, Phil Boyer, Hal Fishman and Paul Moyer. Lorenzo Lamas has kept various aircraft at Van Nuys Airport. The production value of the independently-financed 73-minute film is estimated at $2 million. With an original orchestral score by Nathan Wang, the film features over 20 visual effect shots and is mixed in Dolby 5.1 surround sound. The documentary includes rare footage from a half-century ago, as well as never-before-seen negatives that date back to the airfield’s opening. 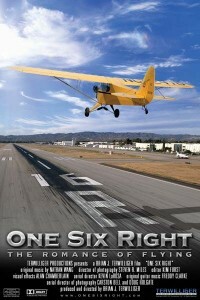 Faced with the monumental task of reducing over 120 hours of footage to 73 minutes for the final film, Terwilliger says “One Six Right” ultimately depicts the passion of people that fly everywhere. “It’s this passion and this pioneer spirit that has created this airport,” he said. Along the way, Terwilliger became deeply concerned about airport preservation. One of the most compelling elements of the film, ironically, isn’t even about Van Nuys Airport. It’s the footage of the recent overnight runway destruction by bulldozers of Chicago’s popular Meigs Field, a victim of Chicago politicians’ desire to convert the airfield to a park! The film has several messages, according to Terwilliger. Ernie Bankey, WWII triple ace and ace-in-a-day, was an interviewee. To make an impact, however, the film has to be seen. Terwilliger is hoping for more than that, however. He’s eying an Academy Award nomination for Best Documentary Feature. “In order to be considered for the Academy Awards, you have to be a theatrical film, seen in a movie theater,” he said. When it came time to plan the premiere, even the venue fit in with the night’s theme. During his speech before the film began, Terwilliger commented that the Hollywood Pacific Theatre was built in 1928, the same year Van Nuys Airport was born. “When I learned that fact, I knew we had to have it there,” he said. 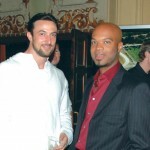 With the successful premiere behind him, Terwilliger is talking to major distributors, and is confident that the documentary will be picked up and be distributed theatrically, at first in a limited release in Los Angeles. “Beyond that, sometime as late as January, we should go to four additional cities,” he said. Although it was never his intent, Terwilliger says the epic aviation film could eventually make its way to television. Since “One Six Right” was filmed in high definition, the History Channel, Learning Channel, Outdoor Network and Discovery HD are all potential outlets. After years of suspense, Terwilliger no longer has to wonder if the film he made will be “accepted and enjoyed.” The hundreds of people that came up to him that night to enthusiastically congratulate him confirmed that he had produced a winner. 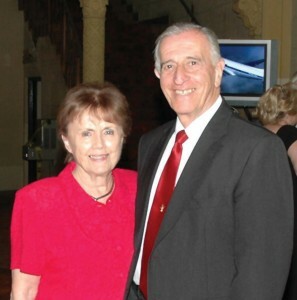 Si and Betty Robin, Sensor Systems, continue to support Brian Terwilliger’s project. One of the most enjoyable aspects of that evening for Terwilliger was seeing the reactions of people who knew little about aviation before seeing the documentary. Confirmation that his documentary is what he hoped it would be continues to arrive in the form of calls and emails. “I’ve been inundated with hundreds and hundreds of emails,” he said. A small percentage of the mail has been from people who were at the premiere and wrote to thank him for doing such a wonderful job on the documentary. Many others came from people who haven’t seen the documentary yet, and want to know when it will be available on DVD, after reading about it or hearing about it from a friend. For those who do ask when the documentary will be available, the answer is at the end of the year. The website is an indication of interest as well. On one day alone (July 20) by 5:30 p.m. Pacific Time, it already had 4,622 unique visitors. To see the trailer, or to reserve your DVD, visit [http://www.onesixright.com]. 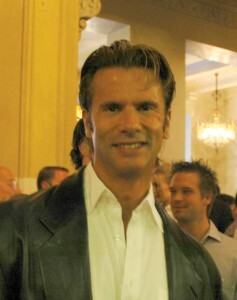 David Frazer was the first assistant director on the film. 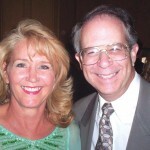 Elliot Sanders, president of VNYPROP and Barbara Cesar, one of the film’s investors and owner of Syncro Aircraft Interiors, both spoke in the film. L to R: Van Nuys Airport air traffic controllers Steve Woodruff and Don Lewis (who appeared in the film).